Madalina Diana Ghenea is a Romanian model who studied ballet and piano. She began to work as a model at 15 when she moved to Milan from Romania, for Gattinoni's fashion shows. However, as she said, she never gave up studying and quantum mechanics is her passion. She became famous in Italy in 2010 thanks to a TV commercial for "3 Italia", with actor Raoul Bova and Teresa Mannino. 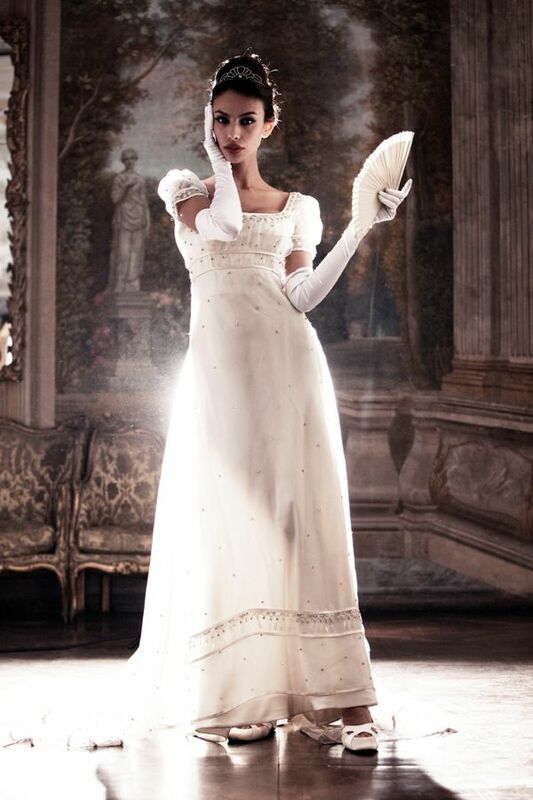 In this exclusive photo shoot she wears Gattinoni's vintage dresses, displayed in the Boncompagni Ludovisi museum during the “Roman Decorative Arts, Costume, Fashion” venue, nineteenth and twentieth century haute couture wear, in the "Fernanda Gattinoni: Moda e stelle ai tempi della Hollywood sul Tevere" ["Fernanda Gattinoni's fashion and stars back when Hollywood was on the Tiber river"] exhibition. Fernanda Gattinoni's Roman atelier became, in the late 40's, a permanent destination of the Italian Capital's "Dolce Vita". First ladies and embassadors (from Evita Peron to Claire Boothe Luce) and many great divas of the past have been customers at Gattinoni's oldest boutique: Anouk Aimée, Ingrid Bergman, Lucia Bosé, Bette Davis, Marlene Dietrich, Rossella Falk, Audrey Hepburn, Gina Lollobrigida, Anna Magnani, Kim Novak, Lana Turner, Monica Vitti and many others. The event, dedicated to those actresses who elected Fernanda Gattinoni as their favorite, will open with the costumes Ingrid Bergman wore in "The Greatest Love" (1952) and "Cactus Flower" (1969). It will also feature the costumes worn by Lana Turner, Fernanda Gattinoni's customer since 1953, during the shoot of "Flame And The Flesh" (1954) in Cinecittà studios. Among the other highlights the collection worn by Kim Novak for "Casanova" (1958), and a micro-collection of little black dresses from Anna Magnani's personal wardrobe. A special section will be dedicated to Audrey Hepburn and those dresses created by Fernanda Gattinoni for her character, Natasha, in "War And Peace" (1956). Since then, Audrey, whilst mantaining her association with Givenchy, became an habituè of Madame Gattinoni. A photo exhibit, along with the 23 creations of costumes and dresses, illustates the relationship between this rising star of Italian fashion and style and international celebrities. Classic documentaries on the maison and clips from films like "E The Greatest Love ", "War And Peace", "We, The Women" (1956) and "Cactus Flower" (1969) will be also screened. A must-go to event, sensational and once again portraying Rome as the capital of creativity and talent.